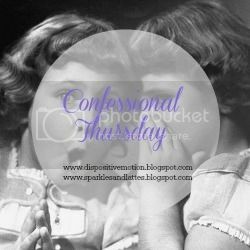 Today I'm sharing some confessions, enjoy! It is so hard letting go. Brayden came home this week with a permission slip for his first 1st grade field trip - basically his first official field trip. Last year they only went on one and it was to a local farm that is literally down the street. Well this one is for the Lincoln Park Zoo which is in the freaking city, about 40 minutes away. While I know to some this may not sound like a big deal, but for me to put my kid on a bus last year (which drives him 1/2 a mile to school) was hard enough, now I have to put my trust into a bus driver I don't know to take good care of driving my son to and from the city. Ugh, it just makes my stomach turn. I told myself I would stop snacking at night and that happened for like 2 nights... and I wonder why I can't lose weight. We have 2 weddings coming up and while I have plenty of dresses I could wear, I want a new one, at least for one. And I'm going to get one. Shhh don't tell the hubs. I'm hoping my mom will want to watch her adorable granddaughters next week so I can go look for said dress. That I may have turned into a crazy person this week trying to find one of those damn hatchimals! Have you heard of them? Those little birds/bears/dragons/ that hatch from an egg and then you take care of from baby - toddler - adult? Kind of like a furby. Anyway, Ella has been saying this is number 1 on her Christmas list (aside from a skateboard, silly girl) but I thought I could wait on it. Well Target and Walmart and Amazon are the only places I know that have them and the certain one she wants is on Amazon for double the price and sold out everywhere else, or so I thought. I literally called every single Target within a 1-2 hour radius (yes, I was even considering driving to WI to get it) but thankfully a Target only 20 minutes away has one! I'm going today to pick it up and I swear if it's not there, I'll cry. The crazy things us parents do for our kids! But I heard this was going to be the "it" toy of the year and I don't want to be hunting this thing down in December. These Cubs championship games are killing my sleep schedule! I LOVE where they are and watching is so fun, but I'm definitley drinking more coffee than ever lately. Hope your Thursday is great, see you tomorrow! Haha nothing will kill a sleep schedule like baseball in October. I am somewhat sad but relieved that my team isn't playing this year :P.
Dress shopping sounds like a blast! I hope you get to go! The Cubs are seriously stressing me out. I can't wait too much of a game - I just get nervous! Good luck with that toy - that is stressful! If you need someone to look else where, just let me know! I'm so sorry that other kids were making fun of Brayden. ugh. Not okay. :( SO sorry mama! Hope you get to do some solo dress shopping! Oh my gosh. That breaks my heart about Brayden. That is not fair. I hope those kids quit it. I think you should rent a dress from rent the runway if you have time. It is a great service! I am rooting for the Cubs. Last night was awesome. Huge game for them. My fingers are crossed. I hope you get some alone shopping time if you get a new dress. I know us moms could really use that! The day that Connor tells me that someone picked on him will be the day that my Mama Bear claws come out and ! @#$ will hit the fan. Ok two things about Brayden- I HATE that it's already happening at such a young age. So not cool. And reading your thoughts about sending him on a bus to his field trip is something that I think about too! I even get nervous when my parents have them and drive them- like did they buckle them in right, etc!! Right there with ya!! And late night snacking!!! That's why I go to bed so early! Ugh, I'm dreading the days of mean kids!! So far it hasn't started with our two but I'm sure that it will soon enough for Jacob. Why are kids like that? !